Hello peeps!! Halloween is just around the corner now and I couldn’t help myself with trying out this makeup look!! I cannot take credit for the idea though as I found the eyeshadow picture on Pinterest which had used the color purple instead of pink…but this is my take on it with an entire look!! Not ONLY do I love all things fall related (YES, I’m one of those people) but I love cute and pretty Halloween decorations and anything to go with that! 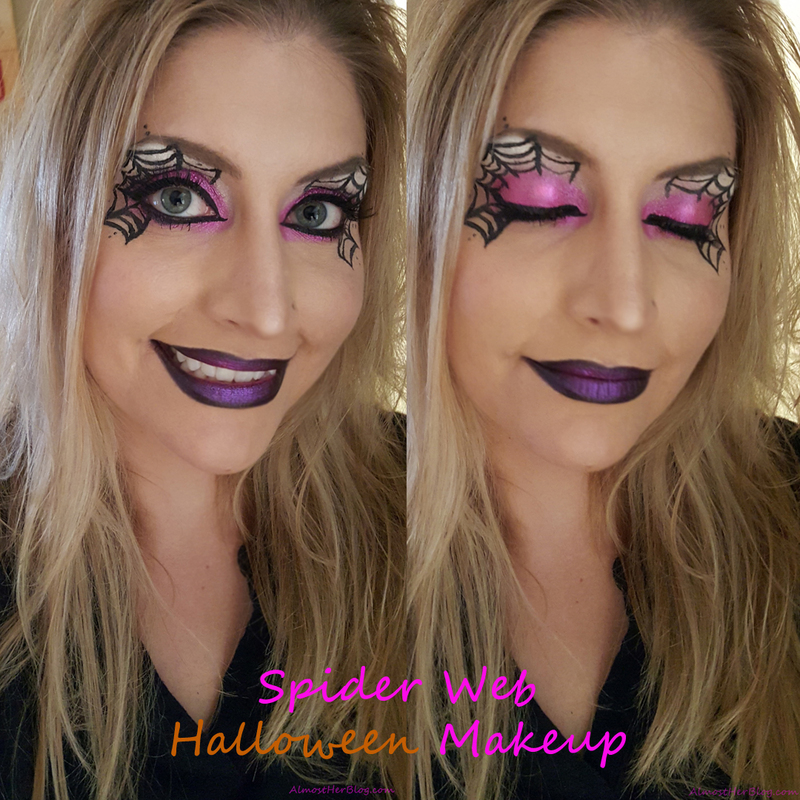 I think this makeup look is fun for any Halloween party and it’s super pretty!! Just make sure if you do this baby you set aside enough time to get it done…it did take me awhile but getting pictures between each step prooobabblly made it take a lot longer than it should. 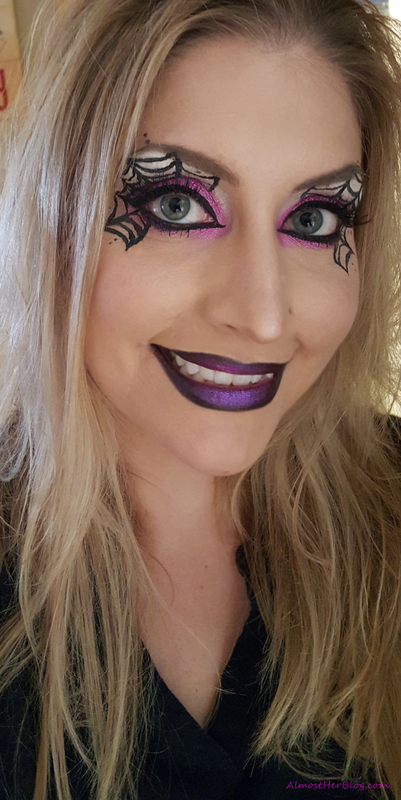 I love the chance to play around with makeup, especially on Halloween, and try out things that I wouldn’t normally do but can TOTALLY get away with this time of year!! That’s the beauty of it really. This weekend I have my family coming over so that we can all carve pumpkins together, which we also did last year! For those that don’t know, I am the oldest of 5 kids and since all my siblings and their significant others are coming this weekend along with the rents it should make for a nice sized party!! I have all my little Partylite witch and vampire decor up, Halloween lights, paper plates, napkins, tableware, etc. ALL ready to go for the party and I couldn’t be more excited! Dan also came home with two new pumpkin carving kits. One was heavy-duty and the other was more dinky and the ones you get everywhere…guess which one he got for me? Yep. haha That’s okay. I’m not as dedicated to carving out pumpkins as much as him. I always end up with a cute cat or something small and he goes off and invents his own devil face or something or other. On a clean eye apply your primer (optional) and then take a white eyeshadow base and apply it all over your eye. I used NYX Jumbo Pencil in Milk and blended it out with my finger so the white color was more consistent. Set the white cream with a white eyeshadow to make blending out your shadow a little easier down the long run. Take a light pink color and blend it along your crease line and up. This serves as your transition shade. Take a bright pink eyeshadow and blend it more concentrated around your crease and also from one corner of your eye to the other to give it more of an ombre look with some depth. Then take your pretty and bright-glittery pink color (I used ColourPop’s “Slave2Pink” all over the lid with your finger. Then blend out a bit and add the pink on your lower lash line using a small angled brush. Take a black LIQUID eyeliner and apply it as you would normally on the top lash line. Instead of making a normal wing drag the liner up and out like a very big and extended wing. 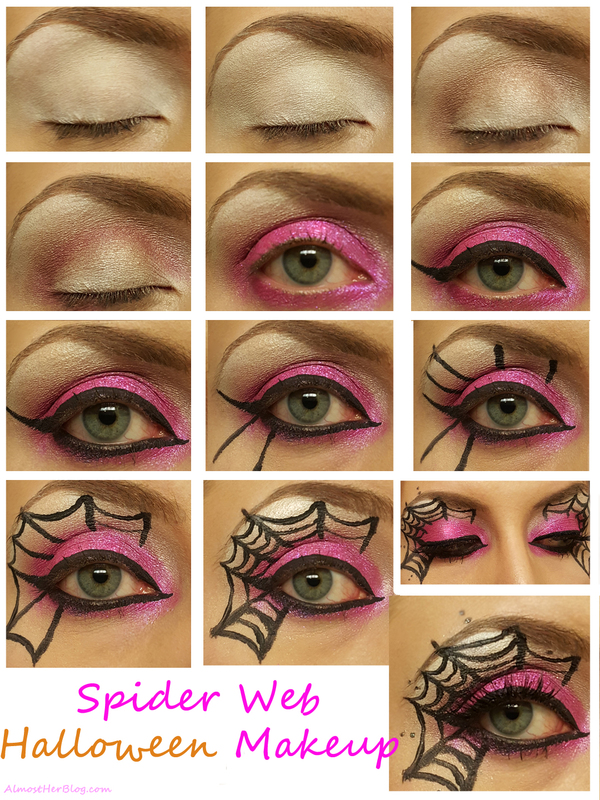 I used this as my starting point for the webs. With a black gel liner fill in your water line. Take your liquid eyeliner again to define that bottom lash line. You can see that I started just before my inner lash line, making a point, and then dragged it along the lower lash and connected it to the end of the wing with the upper lash liner. Take your black liquid liner again and make two lines pointing downwards from your lower lash line spaced a bit apart. I then did 4 more lines all the way up to my eyebrow but do as many as you would like! I had them stop before my pink shadow so that was still bright and in the center. After you have all of the straight lines start by connecting each of your lines together with a little hammock between each one at the top. Continue making the hammock shape between each line and fill it in with as many as you’d like or think looks about right. Feel free to use my picture as a reference point. 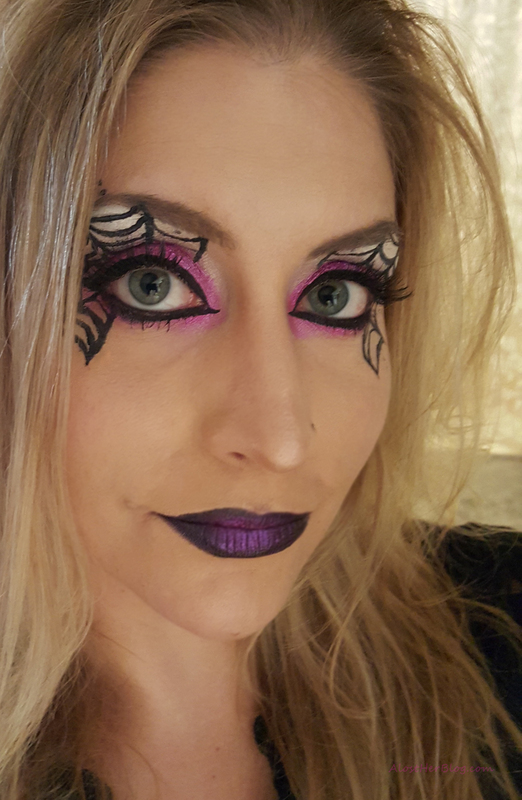 I then added little dots to the ends of some of the webs and made sure to repeat the location of those on the other eye so it looked more even. Over the dots I wanted to add some more sparkle so I put tiny dots of a silver crystal liner over them. I then finished the look with some mascara and completed it with fake lashes, which are a must for this look since it’s so dramatic!! Boom! Done! For the lips: Any black lipstick would work to fill in the lips (I even used a cream eye pencil) and then just accentuate the center with a dab of the eyeshadow that you used on your lid to pull the look together! P.s. This look could be also used with a witch hat or a Halloween type shirt to finish it as well! OMG! I absolutely love this look!! Of course you look gorgeous and creepy with it!!! Love, love, love, love! !